With a controller, familiarity is king. 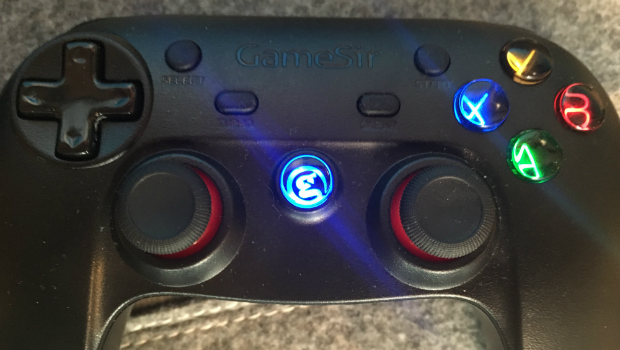 By that metric, the Gamesir G3s Wireless Gaming Controller is a success, and that alone highlights the positive design and functionality aspects that come with the device. All-in-one, sleek, and simple to configure, this controller delivers on almost every single expectation, except for one that the controller inexplicably sets for itself. The G3s has functionality for Android, PC, and various “smart TV” devices. It also shows an option for Apple devices. That “option” is the source of much consternation and varied states of anger and joy. While not truly compatible with Apple devices, there is a work-around that is packaged with the controller. The other devices have full compatibility via Bluetooth or wireless dongle, complete with full control of Android devices. Out of the box, you receive one Gamesir G3s controller, two charging cables with the mini USB standard connection, and a little dongle for use with PC and other USB capable devices. The cables are pretty cheap and relatively short, but this is easily rectified by thousands of similar cables you might have laying around somewhere. While minor, I actually thought the design of the dongle was very sturdy and it also allows enough space between it and the computer so you can remove it easily. The controller is a almost carbon copy of the wildly popular PlayStation 3 controller, fitting as it’s compatible with the console. Two analog sticks are flanked by a directional pad to the left, and a layout of four buttons to the right, with a pair of triggers on either side on the top. The start and select buttons are housed in the center, and there’s a turbo button and clear button as well. The turbo function is not very intuitive to set up, but there are instructions included for doing so. The clear button is possibly related to turbo, but there is no explanation of its intended use. While the directional pad and design is reminiscent of the PS3 controller, the buttons are Xbox based, and the controller has a more matte black style to it that kind of makes the whole thing look like the wicked offspring of the PlayStation 3 and Xbox 360 controller. Switching between device connections is a breeze, and the visual output via lights tells you exactly which device you are attempting to connect to. Other controllers I have had only had one display light, and so you had to memorize or guess the correct combo for each different setup. This is not the case here, and that is much appreciated. The device also has quick re-connections for devices already synced, and I’ve had minimal issues so far, despite Bluetooth technology having a penchant for wonky connectivity. While more on me than the device, I learned pretty quick that having the dongle plugged in, even to a dead computer, will cause the device to not allow Bluetooth connectivity. It took about 4 hours of screaming and bellowing for me to figure that one out, so consider this one “on me.” Just unplug the damn thing and you can get on with your life. The device holds a great charge, as I’ve used it for about 6 hours at a time on average and still have not had a full drain. It also seems to recharge quickly, within about 20 minutes depending on the input used. You can use the controller while charging, so it shouldn’t be too much of a problem to keep the controller powered up. I’m a little miffed that there is an Apple symbol on the controller, and an entire setup specifically for Apple devices, but the controller doesn’t actually have true Apple connectivity. I haven’t seen the device advertised as such, but it still is one of the first things you see out of box. Oddly enough, there are no instructions for Apple connection in the included booklet. However, the product does include a QR Code which provides an app that can be downloaded and used with two “licenses” provided. There are some strange permissions and changes that are required, so I recommend you use discretion with this. The controller can be used in full for the games provided in the accompanying app on Apple devices. This is a heavy limitation, but the provided content is more than ample in making up for it. The Gamesir G3s is a low cost, high functionality wireless controller that keeps it simple, but provides plenty of options for turning your phone, tablet, and Smart TV device into a full blown gaming system. A familiar design and a sleek feel make this an attractive controller to look at and hold. A bit of false advertising is present with the Apple “function” being less than operational, but that is only a bonus on the intended platforms of Android and PC.